Oil on canvas, 58 x 40 inches. he author and art historian Catesby Leigh, writing recently in the Wall Street Journal (December 18, 2007: "Why Presidential Portraiture Lost Its Stature") presented a two-pronged critique of contemporary Presi-dential portraiture, claiming that "the once-august genre of presidential portraiture has lost its shine." Leigh's two-fold thesis was: first: early examples, such as Gilbert Stuart's George Washington (The famous Lansdowne version) were based on poses from classical sculpture and included elements of power and grandeur, such as columns, velvet drapes, swords and even Roman fasces, (thus imparting the power of the office). Why, the 1982 White House portrait of Gerald R. Ford (by artist Everett Raymond Kinstler) shows merely a man in a three-piece suit! It could be "a bank president or Major League Baseball commissioner" complains Leigh. Secondly, contemporary Presidential portraits, including Kinstler's Ford, Greta Kempton's Truman (1947), Norman Rockwell's Nixon (1968) and Nelson Shanks' Clinton (2005), look, cries author Leigh, like "touched-up photographs." "The poetry is just about gone," opines Leigh. Well, let's have a look. Oil on canvas, 60 x 43 inches. 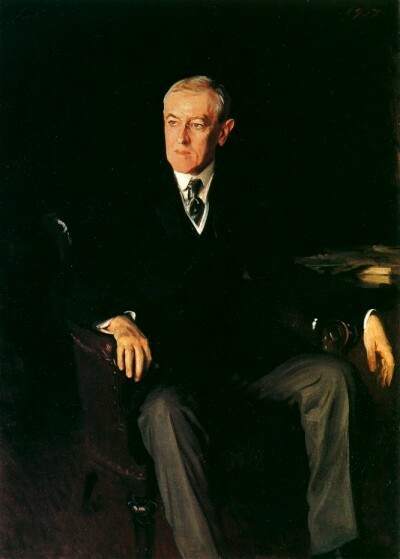 Leigh correctly senses a turning point in the work of the great John Singer Sargent (1856-1925), who went twice to the White House: in 1903, to paint Theodore Roosevelt, and again in 1917 to record Woodrow Wilson. Both paintings are notable in the White House collection in that both are totally devoid of any background elements. 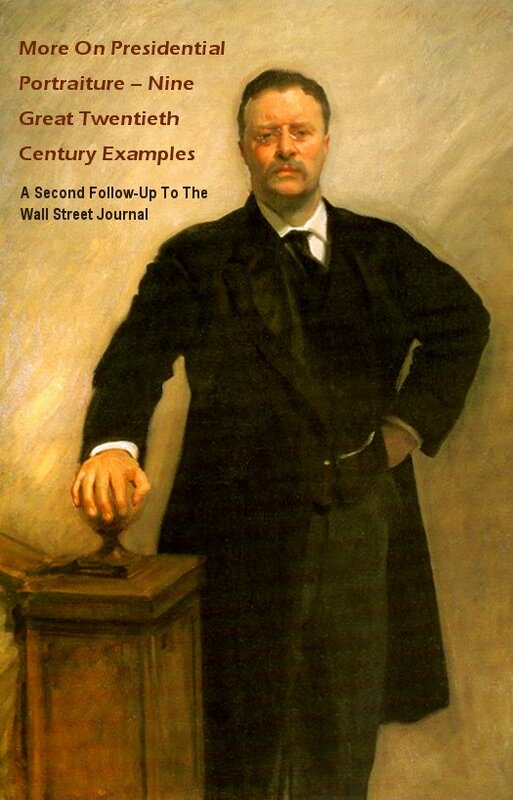 In the Roosevelt (shown at the beginning of this article), we have the newell post of the Grand Staircase, to allow the President to place his right hand there in a commanding gesture. In the Wilson, only the merest suggestion of the presidential desk emerges from an impenetrable dark background. Both paintings otherwise eschew the "trappings of office" and concentrate on the personality, character, and appearance of the man temporarily occupying the most powerful office on earth.